Log into the WordPress site using your U of M Internet ID and password – the same username and password you use to log into your U of M email account. If you are using a browser where you are already logged into your U of M email you will be logged into the WordPress site automatically. On the dashboard, select Posts and then Add New. See what this screen looks like. Title your post and then add content. See what this screen looks like. See following sections on formatting text and adding media. IMPORTANT: On the right of the screen, in the Categories box, select 2019 Thailand Learning Abroad, See what this screen looks like. 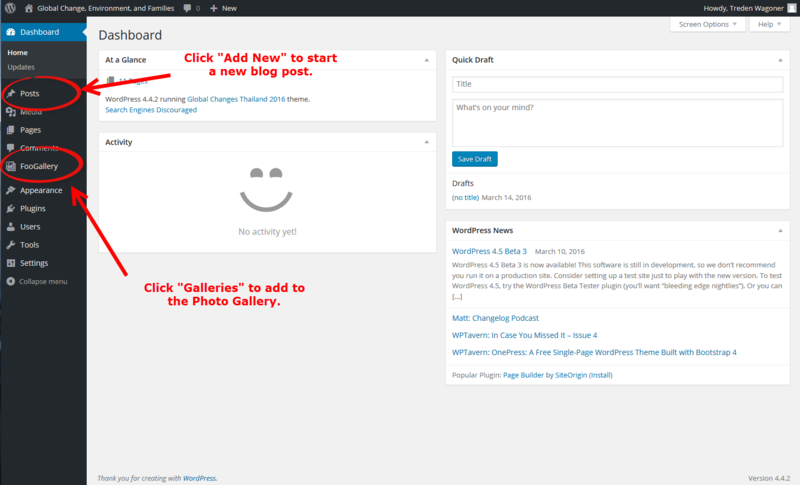 Your post, when published, will now appear when “Students’ Blog” is chosen from the main site menu. Use the Standard format for your post. This looks best with our WordPress theme. You can also add keywords to your post using the Tag box. You can enter words individually or choose from the most used tags list. See the following section for a list of suggested tags (or keywords). Tags will help site visitors find your post and others that share similar topics. Select Save Draft, if you need more time and want to come back and finish your post later. If your post is complete, select the blue and white Publish button in the upper right. Hover over or select text you have entered to see the formatting tool bar. The paragraph toolbar has options to align text left, center, and right, and to format text as bold, italicize, hyperlinks, or strike through. Do not upload video files to the WordPress site. Use YouTube to embed videos into your posts (see following section on adding YouTube videos to your posts). Note: WordPress uses a central Media Library to store images and files (e.g., PDF documents). Select the add block button (plus sign in a circle) in the upper left of the edit post screen. Once the image is uploaded and added to the block, select the image to bring up the image block options toolbar. With this toolbar you can align the image within the block and edit the image details. Editing the image details allows you to add a title, caption, and alt-text to your image, see what this screen looks like. Visit https://support.google.com/youtube/answer/57407?hl=en to learn more about uploading video. Return to the WordPress site to add the video to your post. Scroll down to Embeds and expand to see all options. Paste the URL of your YouTube video and select Embed. This block can be aligned and moved just like an image block (see above). Select Publish in the upper right when you are ready to share your post with the world. Log into the WordPress site using your U of M Internet ID and password. The same username and password you use to log into your U of M email account. If you are using a browser where you are already logged into your U of M email you will be logged into the WordPress site automatically. On the dashboard, see what this screen looks like, select FooGallery and then Galleries. Under the heading Gallery Items, select the Add Media icon, see what this screen looks like. 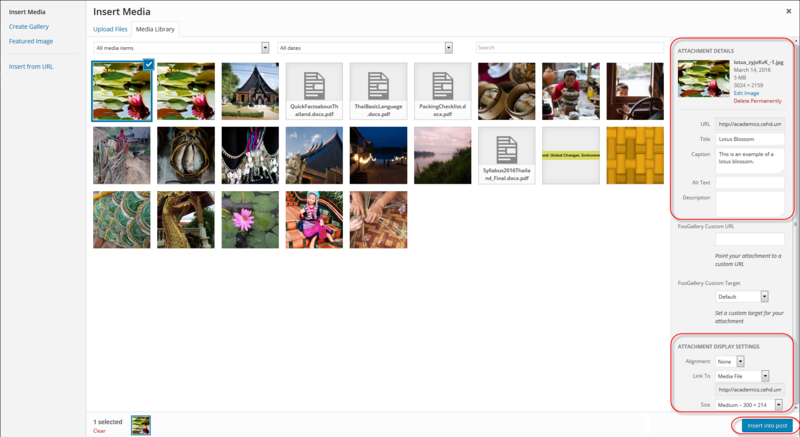 You can drag and drop files or click Select Files to browse and select the files to upload. In the Attachment Details column, see what this screen looks like, add a descriptive Title (e.g., Fish Market on the Mekong River), and a Caption (e.g., Fishermen sell fresh caught river fish in an open air market in Chiang Mai). The caption will appear with the image when a site visitor views the full size image. Select the blue and white Add Media button. Do not edit the other gallery settings. Select the blue and white Update button.